Because I leave in less than a week for my new position (which you can read about here), I have been going out of my way to wear as many different gems from my closet that I won't be packing with me (i.e. ; white shorts, button downs that need ironing, colorful and heavy jewelry, etc). I genuinely think I have been to Target at least three times JUST in the past week. There is always something I think of that I need to pack. The good news is, I am almost done with getting everything together and have fit it all into a back pack and a rolling suitcase! I thought about doing a "how to pack" blog post, but frankly I don't necessarily feel like an expert on the subject (even though I have been in contact with a lot of really helpful colleagues who have all packed for this job before). I will probably do one in December when I am ready to embark on the next 6 months, and I have become an expert on packing light! The most difficult part of "packing light" is bringing things for mostly business functions, but also including formal and casual wear on top of contrasting climate conditions (Mexico in September vs. Switzerland in December). Is this packing light for 6 months? I will let you know in December. Probably my toughest decision was deciding not to bring any of my hair styling tools (straightener, blow dryer, curling iron). They just take up too much space, and would be relatively useless once I enter Europe because of the low voltage (I have bad memories of blowing out a circuit in a London hotel). What I am wearing now is a pink and green striped button down from H&M, a mint jewel necklace from Francesca's Collections, these scalloped shorts which I am OBSESSED with and have worn a bunch but haven't blogged, from Loft. 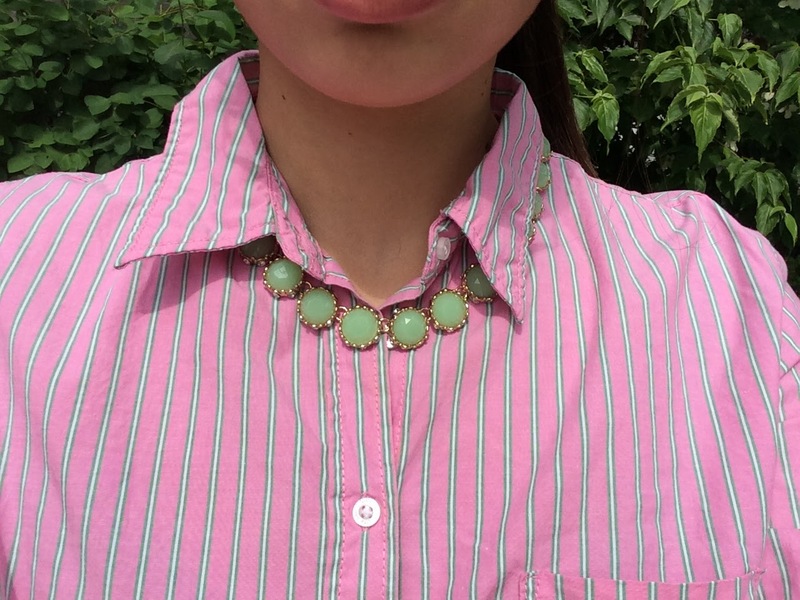 The mint accents the green within the shirt's stripes. 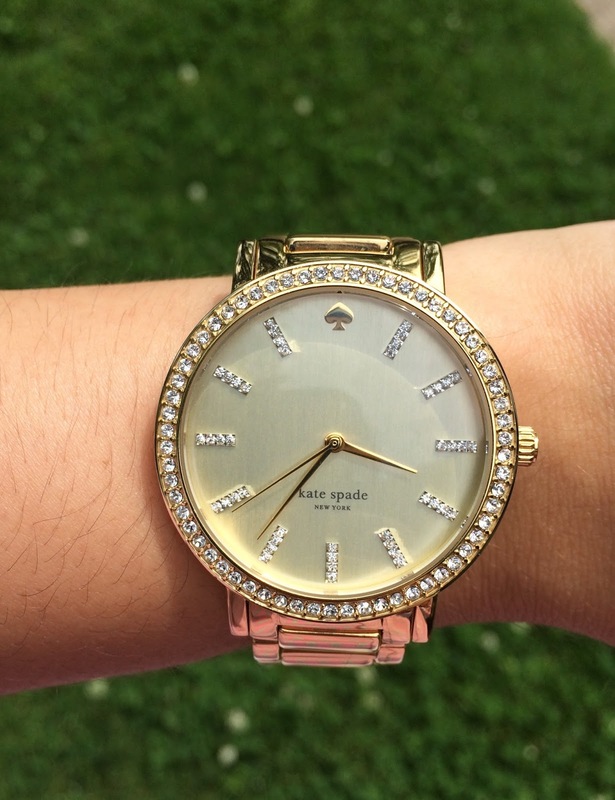 I added some gold detail with my watch from Kate Spade. I continued the gold with my sandals from the Gap. 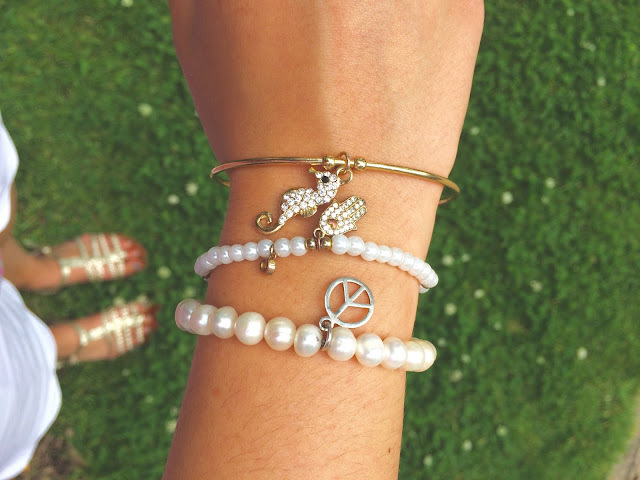 And I matched my accessories with these pearl and gold bracelets. After this week my blog posts will happen when I am on the road. I will be busy, but I will try to post often!